That happened yesterday. It was infuriating for the obvious reasons I'm sure you all see. These observations are factually correct. But they also help create a false narrative. Mentioning the right’s attacks on Warren plus her low approval ratings while citing her “very liberal record” and the controversy surrounding her alleged Native American heritage implies a causal relationship between these facts. Warren is a lefty who has made controversial ancestral claims. Ergo, Republicans attack her, and many Americans don’t like her very much. But that equation is misleading. The better explanation for why Warren attracts disproportionate conservative criticism, and has disproportionately high disapproval ratings, has nothing to do with her progressive economic views or her dalliance with DNA testing. It’s that she’s a woman. The past decade of American politics has illustrated Brescoll and Okimoto’s findings again and again. During the 2012 campaign, Republicans attacked Nancy Pelosi in television commercials seven times as frequently as they attacked her Democratic Senate counterpart, Harry Reid. In 2016, the disparity was three to one. Pelosi’s detractors sometimes chalk up her unpopularity to her liberalism and her hometown of San Francisco. But Reid’s successor as the Democratic Senate leader, Charles Schumer, a liberal from Brooklyn, is far less unpopular than Pelosi—and far less targeted by the GOP. Then, in 2016, everything changed. The percentage of Americans who felt “strongly unfavorable” toward Hillary Clinton exceeded the percentage that felt “strongly favorable” by 20 points. Was Clinton uniquely liberal or uniquely dishonest or uniquely inauthentic enough—compared with the seven male Democratic nominees who preceded her—to explain such a large disparity? Probably not. Gender likely played a key role. Now the same dynamic is playing out with Elizabeth Warren. Pollsters keep recording her unusually high unfavorability ratings. Last September, CNN found that Joe Biden’s net approval rating among Democrats and Democratic-leaning independents was 30 points. Bernie Sanders’s was 18 points. Warren’s was two points. In December, when Quinnipiac University surveyed Democrats, Republicans, and independents, Biden’s net approval rating was 20 points. Sanders’s was two points. Warren’s was negative seven points. Warren’s relatively low numbers appear driven by her unpopularity among men. When the University of Massachusetts asked state residents whom they support in the 2020 Democratic primary, Warren tied with Biden among women. Among men, she trailed him by 16 points. These polls often find their way into newspaper articles. The New York Times cited the Quinnipiac survey in its article about Warren’s presidential announcement. On CNN, Harry Enten discussed her polling ratings at length. That’s fine. There’s nothing wrong with journalists discussing public perceptions of a candidate. The problem is that when journalists ignore what academic research and recent history teach us about gender’s role in shaping those perceptions, they imply—whether they mean to or not—that Warren’s unpopularity can be explained by factors unique to her. They start with the puzzle of her low approval ratings and then, working backward, end up suggesting that her policy views or (pseudo) scandals explain them. Reporters dwell on issues such as Warren’s alleged Native American ancestry not necessarily because they think those issues matter, but because they assume that voters think they matter. If voters didn’t, why would Warren be so unpopular? What all this ignores is the harsh truth that when women politicians—especially women politicians who embrace a feminist agenda—overtly seek power, many American men, and some American women, react with “moral outrage.” They may not express that outrage in explicitly gendered terms, just as they may not express their anxiety about a black candidate in explicitly racial terms. They may instead cite DNA testing or hidden emails or San Francisco’s cultural liberalism. Or they may simply say they find the candidate’s mannerisms off-putting. The media’s role is to dig deeper: to interpret these specific discomforts in light of the deeper discomfort that Americans again and again express with ambitious women. Obviously, I agree with him. I'm not sure Warren can win but the media pulling this tired crapola again is maddening. They have done zero self-reflection on their behavior during 2016 and remain defensive and obnoxious about any criticism. 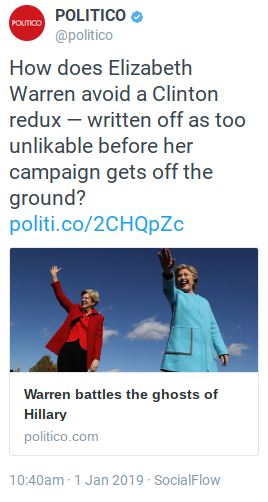 They are already showing they're prepared to do exactly the same thing to other female candidates. Warren and Clinton are both highly accomplished Democratic lawyers and Senators --- much like many of the men running for the job --- but that is where the similarities end. Warren's life's work has been in the economic sphere and Clinton concentrated early on feminism, children's issues and health care and then became a foreign policy professional. They are both on liberal side of the fence but their personalities, experience and approach to politics are very different. Beinert is right about what this is about and it will apply to the other women who are thinking of running as well, in different ways. I know that nobody wants to think about this but it's reality. For a tart take on this issue, read this from McSweeney's called "I don't hate women candidates --- I just hated Hillary and coincidentally I'm starting to hate Elizabeth Warren"
And I never chanted LOCK HER UP or created memes showing her in prison, but I did laugh a little at those memes, because the thought of this accomplished women behind bars with all her agency stripped away from her was funny to me. Read on, you won't regret it.